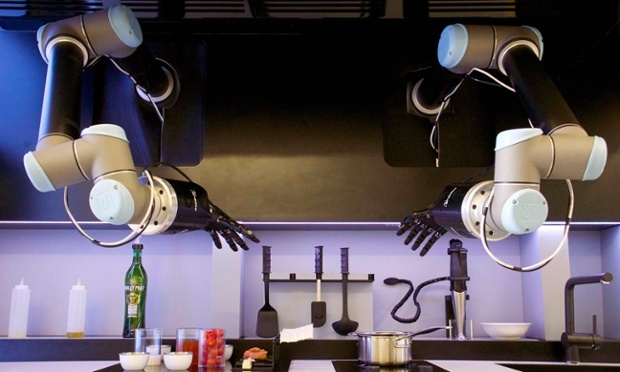 The Economist tells me about Robo-Chef, a pair of robotic hands which will execute any of 2,000 recipes loaded into its memory. 2,000! Link this up with Chef Watson and the world’s your oyster, or bacon, or beef, or brussels sprout. Go to moley.com, the manufacturer, and don’t “skip intro” so you can watch their video: it’s fantastic. The robot even does clean up. It picks up the moves by mimicking its master. I can’t see why anyone would buy a cookbook in, say, five years from now. It’s true that the beast isn’t going to be available for a couple of years, and if “the goal is to produce a consumer version costing £10,000” as the BBC tells us, the threat may be a bit more remote than five years. But Moore’s law will surely come into play and bring the thing within all our budgets eventually. The BBC site has a video and an audio clip.